Metallic Black, upgrades value against list price: 4,705 and LPG MUltipoint system, approximately 2500, wheels & tyres 1500, Chrome sidebars and vents. Stunning, unmarked Lightstone Leather interior.lower price road tax on this range rover, due to being registered before 2006. check with DVLA.Dual Fuel / LPG/ GAS , very low running costs., Upgrades - 20in 7 Spoke Alloy Wheels, Adaptive Headlights, Climate Windscreen, Electrochromic Door Mirrors, First Aid Kit, Metallic Paint, Personal Telephone Integration, Phone and Voice Recognition, Privacy Glass, Warning Triangle, Luggage Retention Net, Skibag, 6 months warranty, Service history, Excellent bodywork, Beige Full leather interior - Excellent Condition, Tyre condition Excellent, Four wheel-drive, Standard Features - Adjustable Steering Column/Wheel, Air Bag Driver, Air Bag Passenger, Air Bag Side, Alarm, Anti-Lock Brakes, Armrest, Central Door Locking, Climate Control, Computer (Driver Information System), Deadlocks, Electronic Stability Programme, Head Air Bags, Immobiliser, In Car Entertainment (Radio/CD Autochanger), Power-Assisted Steering, Spare Wheel (Full Size), Traction Control System, Auto Dimming Interior/Powerfold Door Mirrors, Bi-Xenon Headlights, CD Changer, Cold Weather Pack, DSP ICE Upgrade INC 12 Speakers ilo 11 Speakers, DSP ICE Upgrade INC 12 Speakers ilo 6 Speakers, Electric Sunroof, Electrochromic Powerfold Door Mirrors, Headlamp Powerwash, Heated Front & Rear Seats, Heated Front Seats, Hi Fi with DSP 12 Speaker, Hi-Fi with DSP/12 Speaker (for HSE), Hi-Fi with DSP/12 Speaker (for SE), Logic 7 Hi-Fi - 14 Speakers Harman Kardon, Park Distance Control, Rear View Camera, Satellite Navigation with TV, TV/Navigation System with Integrated RDS Cassette, TV/Navigation System with TMC, LPG MULTIPOINT SYSTEM, 19in 6 Spoke Wheels, 3x3 point rear seat belts, Air conditioning, Airbags, Alloy wheels, CD Player, Central locking, Child locks & Isofix system, Cruise control, Electric door mirrors, Electric windows, Folding rear seats, Headlamp Wash Wipe, Heated seats, Height adjustable drivers seat, Leather seats, Lumbar support, Parking aid, Power Socket, Power steering, Radio, Remote central locking, Satellite navigation, Side Protection Mouldings, Sports seats, Steering Wheel Mounted Controls, Sunroof, Traction control, Upholstery Cloth, VentureCam. 5 seats, RAC APPROVED DEALER, FINANCE/DEBIT/CREDIT CARDS ACCEPTED, ALL PART EXCHANGE CARS CONSIDERED. 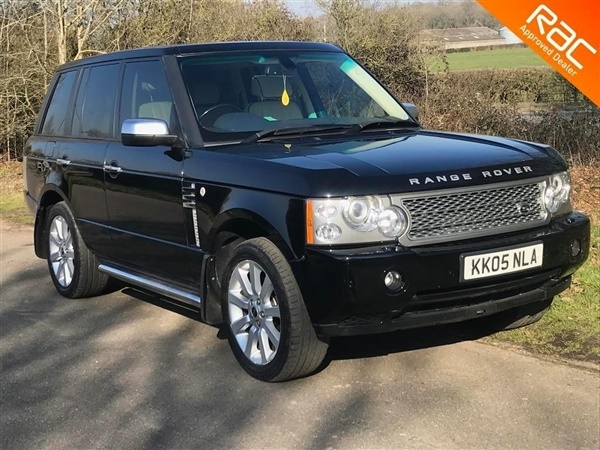 This advert is for a Land Rover Range Rover, click Land Rover Range Rover in Henfield to see more cars like this in the local area. Want to search further afield? Click Land Rover Range Rover in Sussex to search for similar cars in the wider Sussex area.